The Nighthawk X6 router that Netgear announced today sounds a lot like the RT-AC3200 that Asus announced at Computex. One big difference: You can preorder Netgear’s $300 product today for delivery in early July. Asus doesn’t expect to ship its router until August. Netgear’s router (and likely Asus’s, too) is based on Broadcom’s new 5G Wi-Fi XStream chipset. 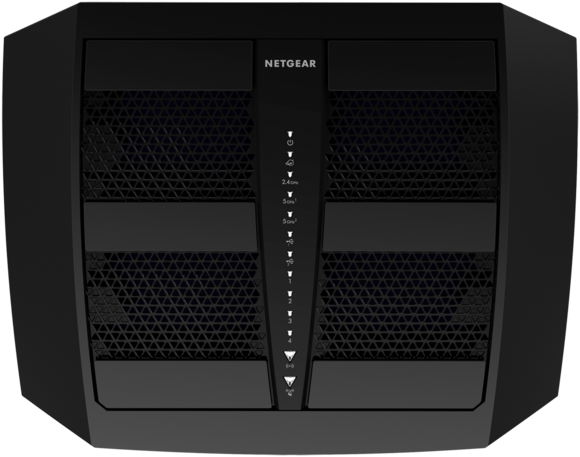 Netgear describes the Nighthawk X6 as a “tri-band” router because it has three radios, but two of them operate on the 5GHz band and the third uses the 2.4GHz band. A year ago, I was thinking tri-band routers would feature 2.4-, 5-, and 60GHz radios (the last of which would support 802.11ad networks). So much for my predictions. So what benefit will you get from running three independent Wi-Fi networks on the same router? Primarily, the ability to support more wireless clients without reducing speed to any of them. Netgear—and Asus—combine the bit rate of all three radios to classify their routers as AC3200 devices: 600Mbps from their routers’ 2.4GHz radios and 1.3Mbps from each of their 5GHz radios. 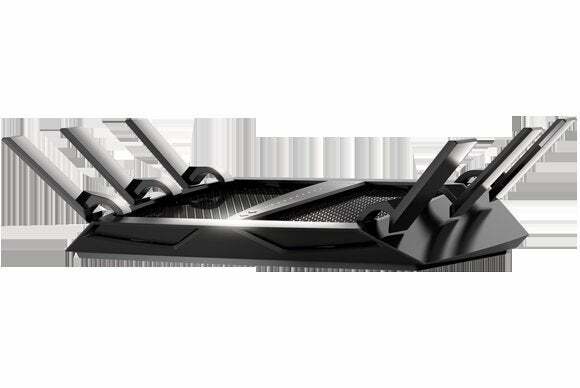 Netgear's Nighthawk X6 is outfitted with six antennas (folded flat in this shot). It supports one 2.4GHz network, one 802.11n network, and two 802.11ac networks. Like all existing 802.11ac routers, the Nighthawk X6 is limited to serving multiple spatial streams to one user at a time—this is defined as single-user multiple input/multiple output (SU-MIMO). Wave 2 802.11ac routers, expected to hit the market in 2015, will be capable of serving multiple spatial streams to multiple users at once (MU-MIMO). 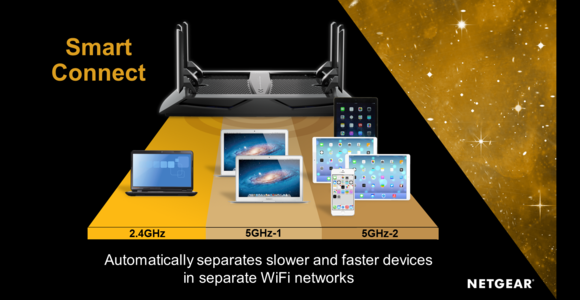 Wave 2 802.11ac routers will also have other advanced features, so the Nighthawk X6 and the Asus RT-AC3200 are essentially stopgap measures until that more advanced technology comes to market. But if you live in a house where several people need high-speed bit streams at the same time, these new routers could solve a very real problem. The router splits the available channels in the 5GHz radio spectrum into upper and lower channel ranges, and it bonds two in each range to create one 80MHz channel for each radio. Instead of mindlessly dividing the available bandwidth amongst all the network clients that ask for it, Netgear says the Nighthawk X6’s Smart Connect feature will automatically separate slower and faster clients onto separate networks to make the most of the Nighthawk X6’s capabilities. Routers that use Broadcom's 5G Wi-Fi XStream chipset are capable of operating two independent 5GHz 802.11ac networks. A client that’s just browsing the Internet and won’t be adversely impacted by lag, for instance, might be assigned to the router’s 2.4GHz network. A PC or videogame console that’s playing an online game will be assigned to one of the 5GHz networks, while a smart TV or other media-streaming device connected to Netflix could be assigned to the second 5GHz network. “We double the amount of 5GHz bandwidth,” Netgear’s Director of Product Marketing Sandeep Harpalani told me in an embargoed briefing yesterday. “Both 5GHz networks broadcast the same SSID, and the router automatically assigns the client to the best network based on the speed and capabilities of the client.” Harpalani said the router is also capable of load balancing, so that neither of its 5GHz networks becomes burdened with too high of a workload. The Nighthawk X6 is outfitted with two USB ports (one of which is USB 3.0) and can support both a printer and USB storage. Netgear’s free ReadyShare Vault software for Windows allows you to schedule automatic incremental PC backups. The router also supports Apple’s Time Machine software for Mac clients. You can stream media from an attached USB device using the built-in DLNA or iTunes servers (the latter is AirPlay compatible). The router also has an integrated personal FTP server, and it supports OpenVPN for secure remote access. 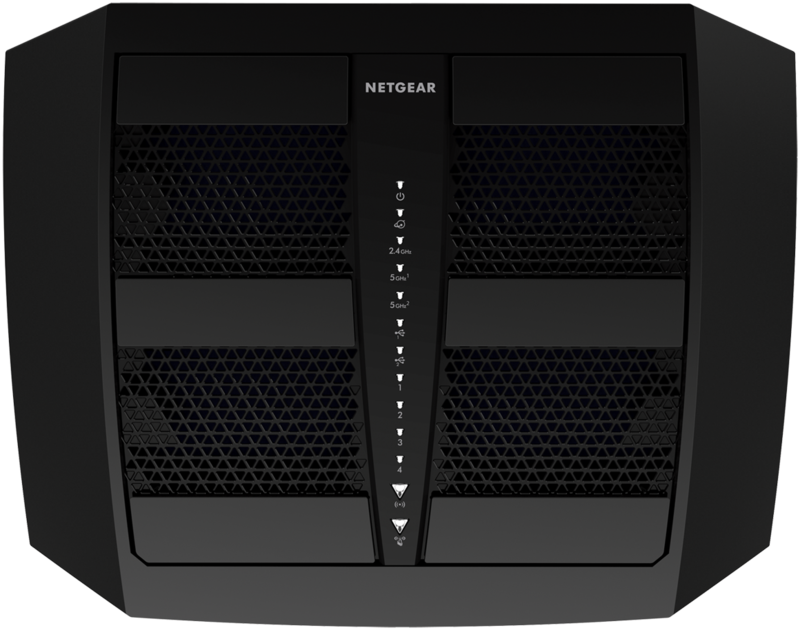 As mentioned earlier, Netgear is now accepting pre-orders, with delivery expected in early July.